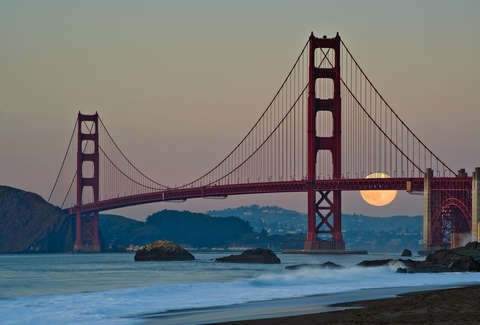 One of the things that makes living in San Francisco so amazing is that there’s always something new to discover. While we’ll never grow tired of looking at the Golden Gate Bridge or listening to the cable car greet us with its ringing bell, it’s finding the stuff that’s hidden by a hill, tucked away in a park, or off the beaten path that makes us happy to call this place home. So wherever you’re going or whatever “important” thing is on your schedule, you should make time for a mini adventure. Like going to all of these places, all of which are exactly where you need to be… even if you have somewhere else to go. There’s a belief in Japan that a daily soak will cleanse and purify the body and soul. And there’s a belief in America that a good meal can bring people together. Onsen, a bathhouse and restaurant in the Tenderloin, is the perfect meeting of the two. Start in the bathhouse where $35 gets you nearly two hours to spend in the communal tub (set at 104 degrees), sauna, steam room, and cold plunge. Then head to the dining room to enjoy a gorgeous meal made with light, seasonal ingredients and plenty of sake. Thanks to this tiny Outer Sunset coffee shop, cinnamon toast is no longer a snack just for kiddos. Trouble’s grown-up version is made with thick, chewy bread that’s smothered with butter: a perfectly proportioned mix of sugar and cinnamon that melts just right so that every bite is as delicious as the one before it. And it comes with a very adult $4 price tag. We promise it’s worth every penny… and tastes even better if you enjoy it with a cup of coffee while sitting outside on the tree trunk parklet. 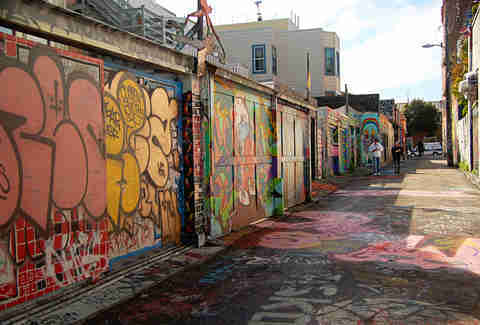 Clarion Alley (between 17th and 18th Streets and Mission and Valencia) is only 560ft long and 15ft wide, but you could easily spend an hour looking at the public art that covers the walls of the buildings. Look closely, however, and you’ll see that these murals are more than just beautiful art. They’re messages about inclusiveness and social justice. They’re speaking about people who’ve been marginalized. They’re about those looking to build a better future. If you want to learn the whole story, the Clarion Alley Mural Project offers artist-lead tours every other Saturday at 1pm for a sliding scale donation starting at $5. Whether you want to row or pedal, a boat ride around Stow Lake is the perfect way to experience a serene moment in an oasis in the middle of Golden Gate Park (while also burning a few calories). You’ll go under an old stone bridge, past the Chinese Pavilion, and right by the waterfall that spills down Strawberry Hill and into the lake. It takes about an hour to make the full loop, after which you can celebrate with an It’s-It or, even better, a cold beer. The Wave Organ is one of those secrets that a lot of people have heard about, but never bother to actually visit. Now that you know about it, don’t be one of those people because this water-activated acoustic sculpture is one of San Francisco’s most magical destinations. It’s located on a jetty in the Boat Harbor in the Marina that was constructed with material from a demolished cemetery, which is either creepy or romantic, depending on how you feel about places where people were buried. Either way, grab a seat, be quiet, and really listen. It’s the only way to truly hear the 25 PVC organ pipes that play music with the rise and fall of the tide. 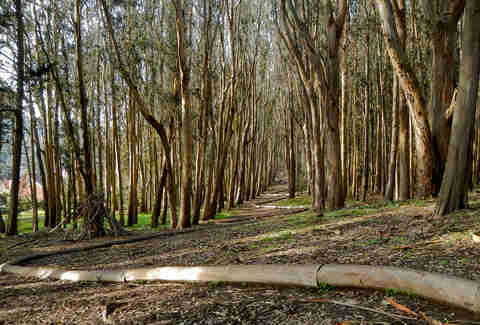 Take a trip down Lovers’ Lane in this 1,500-acre national park if you want to see Andy Goldworthy’s second installation made specifically for the Presidio. You need to know where to look to see the curvy line of branches winding their way up the forest floor; Wood Line is “hidden” in a eucalyptus grove that runs parallel to the Lovers’ Lane path. And though you have time to experience this piece of outdoor art, it’s not a permanent piece, as one day it’s going to decompose and return back to the earth from whence it came. If you need a moment of tranquility, look no further than the oldest public Japanese garden in the United States. There you can wander among pagodas and stepping stone paths, while taking in native Japanese plants, koi ponds, and a zen garden. After, you should enjoy a tea ceremony, but not before climbing over the drum bridge, which is steep in order to take up a minimal amount of space, reflects a full circle in the water, and forces you to slow down and think about every step you’re taking. Visit in March or April to see the cherry blossom trees in full bloom. If you want to enjoy the sweeping views of the San Francisco skyline that you can see from the rope swing atop Billy Goat Hill, the most important thing to remember is to keep your eyes open -- which is harder than you’d think, since this swing hangs from a tree branch at the edge of the hill. It feels like the ground has fallen out from beneath you in the best possible way… as long as you hold on for dear life. This old school tiki bar in the Fairmont Hotel is festive, campy, and touristy in all of the best ways possible. Feast on a pupu platter that will taste much better after your second umbrella-festooned rum cocktail, and listen to the Top 40 cover band serenade you from the floating stage in the middle of the swimming pool-turned-lagoon. And be sure to stick around for at least an hour, since that’s how often the periodic storms rain down from the sky. Or rather, ceiling. Do or do not visit this bronze, life-sized (so, uh, just over two feet tall) statue of the wisest Jedi from a galaxy far, far away. There is no try. 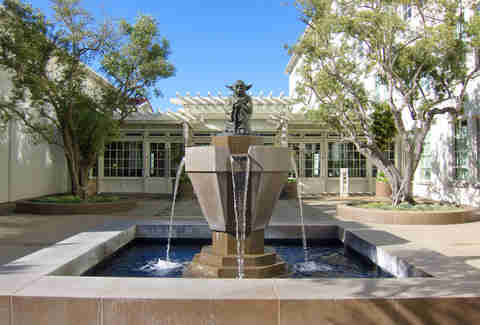 He can be tricky to find, but the fountain is located in front of Building B Letterman Digital Arts Center in the Presidio. May the Force be with you. A herd of bison (it’s okay if you call them buffalo, by the way) have been living in Golden Gate Park since 1892 and have called their current enclosure -- west of Spreckles Lake along John F. Kennedy Drive -- home since 1899. Stop by and say hey to these shaggy beasts on your way out to Ocean Beach. Adults are supposed to be accompanied by children in order to play in this park, but all of the adults in San Francisco technically still are children, so you’re fine. Plus, the biggest thing kids are taught is the importance of sharing and these steep concrete slides were definitely meant to be shared. Just be sure to wear pants and bring a piece of cardboard (though the latter is often left there by other sliders). In 1927, an octagonal lookout station was built at Land’s End to watch for ships and announce their arrival. Ninety years later, it’s totally abandoned and hidden amongst the trees while it awaits restoration by the Golden Gate National Recreation Area. But until that happens, it’s a creepy, yet delightful, hidden gem that goes unnoticed by most and is just begging to be Instagrammed. 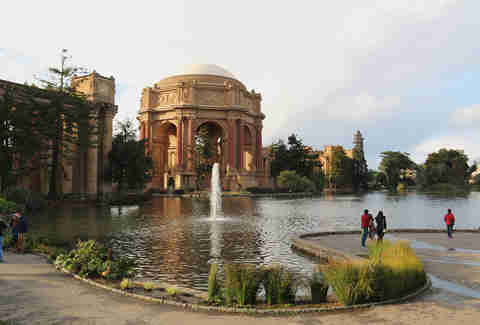 Stop by Lucca Delicatessen or Marina Subs to pick up sandwiches and enjoy them at this iconic SF spot that was built for the 1915 Panama-Pacific Exposition. Since then it has become a place for every single bride to take wedding photos, but also to just enjoy a peaceful afternoon watching the swans glide around the lagoon. Go lawn bowling at the oldest lawn bowling club in the U.S.
People have been lawn bowling on this green since 1901 and the competition now is a fierce as ever. Watching the game, you may think it’s like bocce, but any serious player will tell you that while bocce is like checkers, lawn bowling is like chess. Want to learn how to play? The club offers free lessons every Wednesday (and some Saturdays) at noon. Sure, you can get a bleacher seat for relatively little money, or you could head to the Portwalk along the outfield wall and root root root for the home team for free. Think: The old Knothole Gang, but right along the water’s edge and with amazing views of the bay. You’re allowed to watch for three innings, at which point you can head across the street to any of the nearby bars and catch the rest of the game on TV. Daisy Barringer is a San Francisco-based freelance writer who always stops to say hi to the bison when she’s riding her bike to the beach. Stop and say hi to her on Twitter.